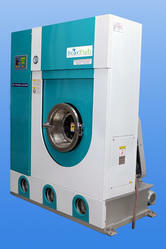 Perc Dryclean Machine. with 3 Filter, Fully and semi automatic Machine. All necessary parts in Stainless Steel. 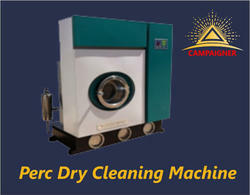 Perc Dry Cleaning Machine is by small stand-alone laundries to large centralized dry cleaning launderers. Capacity: 6 to 36 kgs with various integrated filtration & recovery options. As a service provider we are providing dry cleaning service to our clients and the heating can be done through steam or heating. We use best quality of chemicals such as perchloroethylene and trichloroethylene that will not harm the cloths. Best service, is what our main aim and for that we have advanced machine that can clean, extract, dry and deodorize as its continuous process. We have highly sophisticated European technology equipments as well as using German solvents which are being operated by well-experienced & well-trained operators by European Laundry. To cater the needs of clients for cleansing delicate items, we offer perc dry cleaning services. This type of cleansing is performed using a chemical perchloroethylene (perc) and is suitable for soft fabrics, that can be damaged by water soap or detergent. We offer these at reasonable rates.